iRealHousewives | The 411 On American + International Real Housewives: Andy Cohen Reacts To News Of Joe Giudice’s Deportation! Andy Cohen Reacts To News Of Joe Giudice’s Deportation! Andy Cohen recently took to Twitter to react to the the news that Teresa Giudice’s husband Joe Giudice is set to be deported from the United States to his native Italy following prison release. 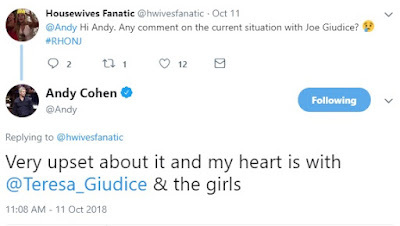 When asked how he feels about the situation with Joe Giudice, Andy replied, "Very upset about it and my heart is with @Teresa_Giudice & the girls."